Abortion will be considered unthinkable 50 years from now Vox, 4/4/19. Didn't expect an article like this from Vox. Kansas lawmakers OK mandating notice on abortion ‘reversal’ News Tribune, 4/7/19. Notice they never say research led by "an abortion-rights doctor" or even "a pro-choice doctor" when the situation is reversed. They just say "doctor" and leave out implications of political bias. They base their arguments on a 2018 study led by an anti-abortion doctor and medical school professor in California and note progesterone has been used for decades to prevent miscarriages. With ‘Unplanned,’ Abortion Opponents Turn Toward Hollywood New York Times, 4/8/19. Decent summary. We tip our hats to all the people who worked hard to get this film out there. 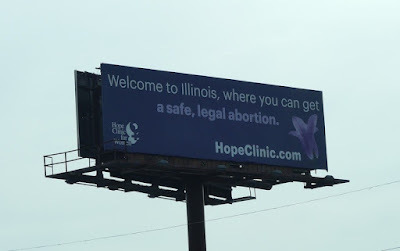 New billboard: "Welcome to Illinois, where you can get a safe, legal abortion" CNY Central, 4/8/19. Hope Clinic of Illinois put up this billboard on the border between Illinois and Missouri as commentary on Missouri's more restrictive abortion laws. According to Guttmacher, Illinois' abortion rate is 87% higher than Missouri's (Illinois has 15 abortions per 1,000 women age 15-44 while Missouri has 8). Is our political divide, at heart, really all about abortion? Yahoo News, 4/9/19. It's frustrating when your primary social circles don't share your pro-life views. I'm glad we at least have online communities to help the pro-life "non-traditionals" (secularists, LGBT, Democrats, liberals, feminists, etc etc) coalesce. A 2008 study in the journal Political Research Quarterly found that while [political] defections were uncommon, when all else was equal, a “pro-life” Democrat was more than twice as likely to switch parties than the average. A “pro-choice” Republican, over time, was three times as likely to re-identify as a Democrat, the researchers found. “[I]t is difficult to think of many other issues that would rival [abortion] in the capacity to influence partisanship,” they wrote. The White House Is Hosting a Screening of the Gory Anti-Abortion Film Gosnell Slate, 4/9/19. For those of you who saw Gosnell, did you consider it "gory"? All three women are surprised at how well they’ve taken to parenting, shushing cries, mopping up dribbling mouths and tending to bumps while I interviewed them, despite never wanting to have children and using birth control to actively stop that from happening. They all say that things definitely would have been different if they'd had a detectable pregnancy. “I would have had an abortion to be fair,” Beth says. “But I couldn’t imagine that at all now. Fresno State Students for Life club helps save unborn baby from abortion The College Fix, 4/12/19. Three good stories wrapped into one: (1) a college student chooses life and (2) in the process becomes a pro-life advocate, and (3) a pro-choice professor's aggression toward's the Fresno State Students for Life ironically leads to the group's expansion and renewed commitment. Oh, also the professor paid $17,000 in a settlement over the incident, so there's that.